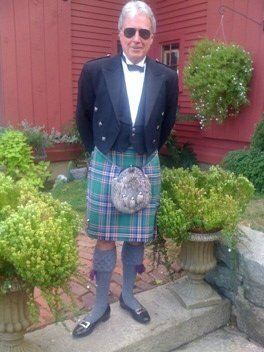 The your kilt photos 2 page is an extension to the your kilt photos page, which I have happily had to build out of necessity, having received so many wonderful photos from the readers of this web site. I am delighted to begin this page with some excellent photos, kindly sent to me by James Graham Clyde, who likes to be known as Jim. The first photo to be featured was taken just before Christmas 2009, at his home in the United States. It shows him wearing one of his kilts, in the Macfarlane Ancient Hunting tartan, and looking very relaxed in front of his roaring log fire. Jim has been wearing kilts for about three years now, this update Feb 2010, and he owns three of them, with a fourth on the way. I include a quote from his email, in which he so eloquently states. "but you are correct... wearing a kilt takes a certain amount of sang froid, but once one feels comfortable wearing it, all doubts subside. 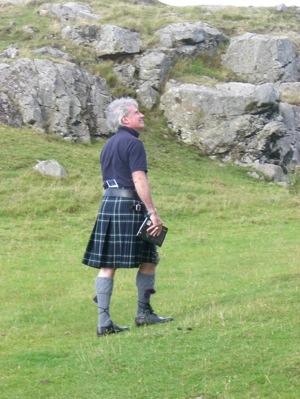 The kilt is a very unique, elegant and tasteful sartorial expression. I wear mine all the time... to parties, church, dinners etc." Jim is very proud of his Scottish heritage, his father's parents were both Scottish, and his mother also came from a long line of Scottish ancestors. 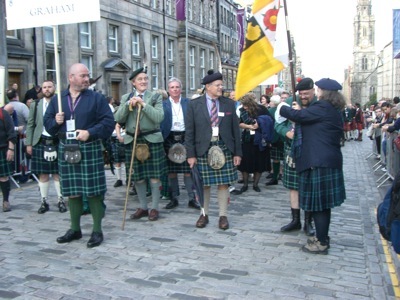 The next photo shows Jim taking part in the Graham clan march, at The Gathering in the summer of 2009. You can see Jim in the center of the photo, and standing off to his right is His Grace, James Graham, 8th Duke of Montrose. Jim is wearing his Graham of Montrose tartan in this photo. The next photo shows Jim and his beautiful daughter Jessie, on her wedding day. The wedding took place at the exotic location of Antigua, Guatemala, in 2007. Here Jim is wearing a rented Highland Dress outfit, in the Millennium tartan. And here you can see Jim against a stunning backdrop, this photo was taken in 2008 on the Isle of Skye. He is wearing the Smith Modern tartan. The last photo in this section shows Jim once again wearing his Graham of Montrose tartan. He is enjoying a visit to Smailholm Tower in the Borders, just before The Gathering. I would like to thank Jim very much for his stunning photos, which I consider a very valuable contribution to the new your kilt photos 2 page. I could not have hoped for a better set of photos to launch this page, as Jim is a wonderful ambassador of the kilt, and carries it off very well. 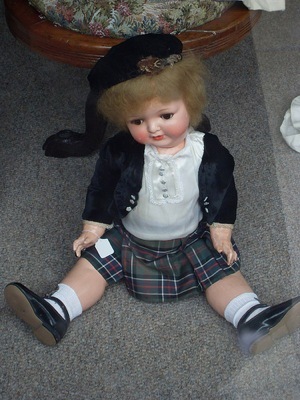 The next contribution to the page (Feb 2010), is with the kind permission of the photographer, who took this wonderful photo of a vintage doll, resplendent in her Sinclair hunting tartan kilt. Alex took the photo, when he saw the beautiful doll sitting as part of the window display at the Jedburgh auction rooms, in the Scottish borders. Lets hope she finds a good home soon! I would like to thank Alex for giving me permission to use his photo, as I feel it adds a new dimension to the page. The next photo has been sent in by Colin, who has made a major contribution to the web site. 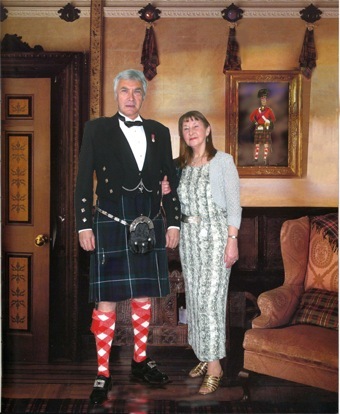 This latest one shows him once again, utterly resplendent in full Highland Dress, attending a Pipes and Drums Ball with his lovely wife Joan. If you would care to see more of Colin's wonderful photos, then follow the link to the your kilt photos page, where you will find contributions not only from Colin but from many other visitors to the site. The next contribution is once again from Jim, who was snapped here heading out to a Birthday celebration wearing a MacFarlane ancient hunting tartan. 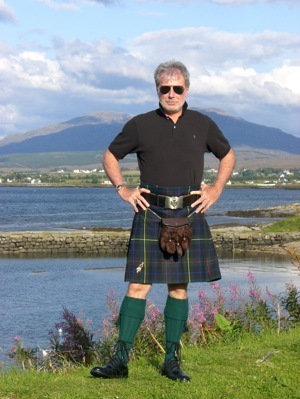 The latest visitor to send me their contribution to the your kilt photos 2 page, is Manuel from Germany. 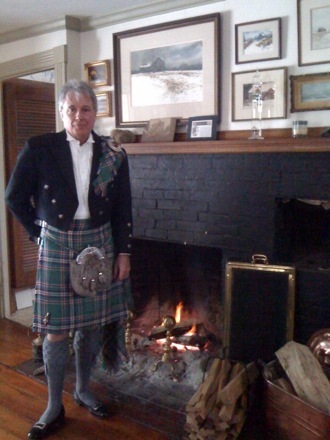 He sent the photo below of him wearing his Black Watch kilt which he bought at a Scotland fair, and although it was sold as a used kilt, Manuel says it looked brand new, and fitted very well. 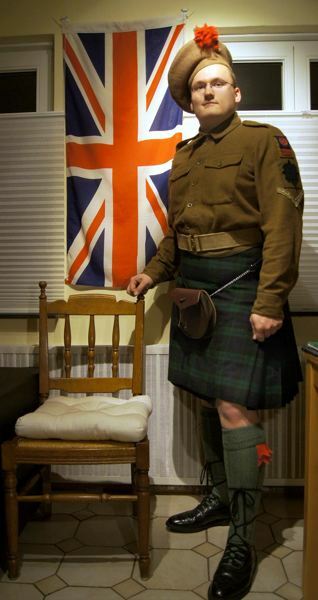 He has worn his kilt to commemorative services at a war cemetery near his home in North Germany. He also wears it to Scotland festivals, Christmas church services, and as often on a daily basis as he can. So thank you Manuel for sending me your kilt photo, and continue to enjoy wearing your kilt in good health. I hope you enjoyed these photos as much as I have, and that they inspire and encourage you to send me your photos, for inclusion on the your kilt photos 2 page. I look forward to it growing, as you keep sending me your wonderful photos over the next months, and years.